It was a thrilling concert, offered by the highly motivated professionalists of l’arte del mondo and the perfectly prepared lay choristers of the Barmen-Gemarke choir from Wuppertal (who sang the whole piece by heart at the stage’s edge). At the same time it was an extraordinary dance evening of the Kamea Dance Company with pictures that have deeply immersed themselves in the memory of the audience of Bayer Kultur. Images, movements and moods that will likely be present again when Johann Sebastian Bach’s complete St. Matthew Passion will be listened to. A Jew created this very sensual interpretation of the central work of Christian-Western culture without giving up his religious identity. This already is something special. In fact, all the contributors have come together, serious about the matter, open to others, and with a deep respect for Bach’s creation, which had to endure a lot in the heavily shortened and shaken up version of “Matthew 2727”, but did not come to any harm. 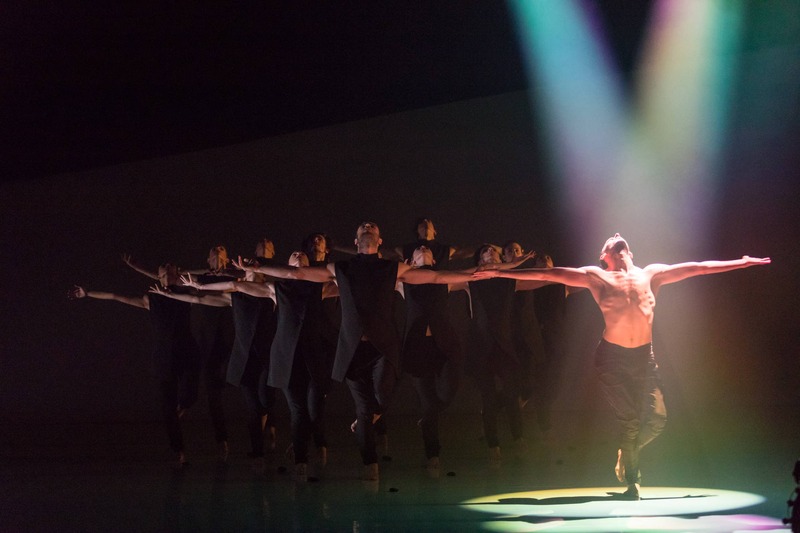 Conductor Werner Ehrhardt and chorus conductor Wolfgang Kläsener developed the concept and assumed responsibility for the acoustic part, the Israeli choreographer Tamir Ginz and his lighting designer Yaron Abulafia for the optical part. Visitors to the premiere are likely to have felt both levels of this project, which has been enabled and brought together by Bayer Kultur: a successful performance and an exemplary interreligious, intercultural and interdisciplinary collaboration, which points out the message of the choreography. Namely, only when we approach each other peacefully and in mutual respect does mankind have a chance. For Christians there is, of course, even more in the music, which became clear in the reflective chorales, the entrance and the chorus, and in the precisely inserted, highly emotional turba passages. (…) When Elisabeth Graf sings the “mercy” aria, time becomes nullified and you want to close your eyes, which, of course, is not to be done in order not to miss the danced images that are warmed by light and softened by spotlight mist. The lighting also diversifies the white high-gloss dance floor, on which no more than a meter-long shroud is used as the only prop. The rest of the drama is impressively created by light and body, for instance when Jesus is crucified by floodlights, or when the dancers emphasize the text “In Jesus’ Arms of Salvation” with their arms spread apart at right angles. The imaginative and emotional choreography has made an entity from “Matthäus 2727”, although the dramaturgy was turned upside down and shaken up in such a way that it does not reach the profound emotions which leaves speachless the listeners of Bach’s original piece after nearly three hours.